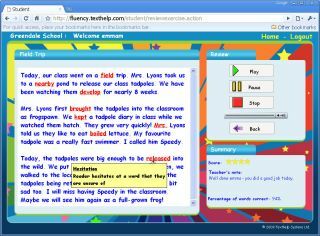 Fluency Tutor is an online software solution for students developing, and teachers assessing, oral reading fluency. The product incorporates passages that align to MetaMetrics Lexile Framework for Reading and includes tools for practicing, assessing, and measuring fluency. Students listen to passages being read aloud with text-to-speech voices and practice their own reading. When ready, they record assessments for teachers to listen to and mark. Several graphical reports are available to show students’ progress. Pros: The software allows teachers to select exercises of the right difficulty for each pupil and to record his or her progress. Teachers can evaluate the fluency errors made, words correct per minute, and level of prosody (expression of reading) for every student. The system is also available to teachers and students at home. Cons: To be truly effective, the product requires complete buy-in from all reading teachers. A school must also have enough computers available for students to practice and take assessments. Overall evaluation: Every school should have a program like Fluency Tutor to help students learn to read. This one is as good as, or better than, most I have seen. Retail price: Starting at $2,245 per school, first year; $745, each year after. Discounts available for multi-year purchase.